Wash and then cut the heads of cabbage into pieces small enough to fit into the food processor. Using the appropriate blade for 1/4-inch slices, process one head of cabbage and place the result into the fermentation crock. Sprinkle a little salt on the cabbage. Massage the cabbage vigorously with your hands to bring out its moisture (this process forms the brine). Do this for 10-15 minutes with each head, using the rest of the salt. Let it sit for one hour. The next step is to pack the salt and cabbage mixture down into your crock. The brine should cover the kraut completely. If there is not enough brine to cover the cabbage, you need to massage the cabbage some more. When you are done packing, spread a sheet of cheesecloth across the top so that, later, when a layer of scum or moldy residue appears on top, you can easily remove the cheesecloth, rinse it off, and replace it. Then place the fermentation weights on top of the cheesecloth; these weights will keep the cabbage submerged in the brine. Finally, cover the crock with a top. We have wooden fitted tops with handles, while my stepfather uses a flat piece of plywood and a brick. Either will work. 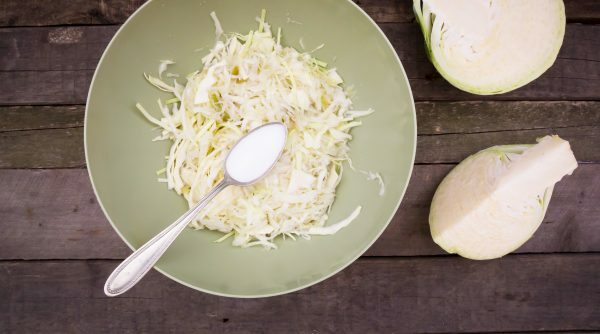 Allow the cabbage to ferment for approximately three weeks at room temperature. Feel free to give the cabbage a taste after one or two weeks to see how it's going, but try not to open the crock repeatedly. When you think the kraut is done, transfer it to quart-size freezer-style zip-lock bags and freeze them. With the sauerkraut in these bags, it is so easy to, say, pull a couple of bags out, run them under hot water for a minute to loosen the kraut, put the contents into a crock-pot with two kielbasa, sit it on low for 5.5 hours, and you will have a delicious dinner waiting when it's done!